We’ve long warned DJs that they should not upload DJ mixes to SoundCloud – the popular audio sharing platform – because of the risk that their mixes will be removed for alleged copyright violation/s. It seems things have just gone from bad to worse in this respect, with a shocking piece of evidence that further reinforces that the platform really is utterly unsuitable for sharing DJ mixes on. 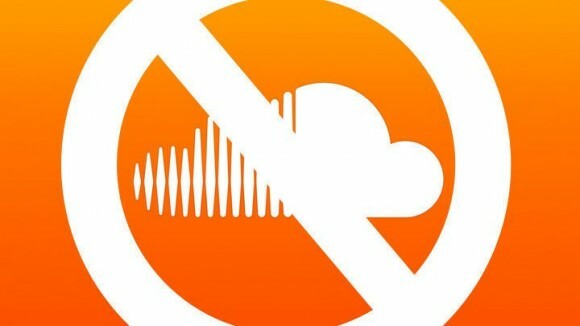 What this reinforces, alongside years of evidence that DJ mixes are taken down regularly and without warning (everything from radio shows to amateur mixes, although curiously big names seem to get away with it more), is that increasingly SoundCloud simply isn’t a safe place to upload your DJ mixes to. Now, let’s put aside arguments over copyright here for a second: After all, “mix tapes” have always been a grey area (are they exploitative or promotional for the artists featured?) and indeed, Warner (for example) actually uses SoundCloud itself, unlike Universal which conspicuously doesn’t. Plus, we’re not talking about DJs making moey from their mixes, after all; we’re simply talking about being able to share our work. Instead, let’s look at the problem for DJs and how they can solve this. The problem is that you need a way to show the world what you bring to the table as a DJ, and DJs by definition play other people’s music. 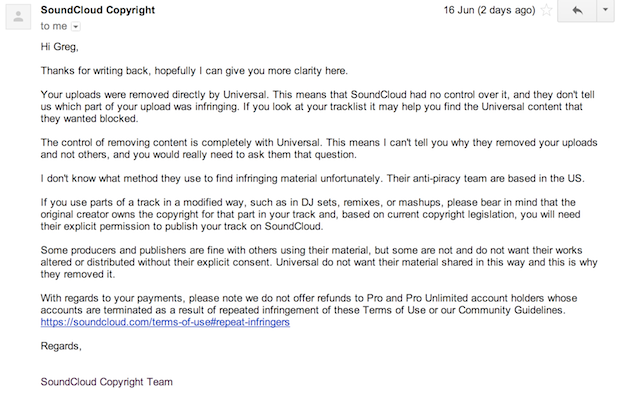 That means copyright issues, and we’ve hopefully shown you that SoundCloud does not have your back on this. At best, you’ll put a great mix up, share the link with your friends and DJs, promoters etc, and when they come to listen, it’ll be gone due to a dreaded copyright removal. At worst, you’ll lose your work, have no backup of it, and it’ll be gone forever. The fact is that for material you own the copyright in or have permission to use, SoundCloud is a great platform (we use it for our artist interviews in courses like the Digital DJ Masterclass, for instance), but for DJ mixes, it really is a complete no-go zone. So what are you to do? As ever, we recommend services like Mixcloud. Mixcloud may look similar, but it operates on a different type of licence. One of the stipulations of Mixcloud’s licence is that mixes on the service aren’t downloadable (an option you don’t have to have switched on in SoundCloud either, and which removes one of the bugbears of the piracy argument, although as you can see, that won’t stop your mix being removed), and also it is harder to reach a big audience on Mixcloud than SoundCloud, but you’ve not really got much choice in that. Similar services include House Mixes and Mixcrate. Find one you like and rest assured they’re made for DJs, not producers, and so your work should be safer on one of these. Me? It has to be Mixcloud – worry removed from your shoulders and your mixes safely available on a smart, stable platform. But whatever you choose, please stay away from SoundCloud. They don’t want you and it’s getting worse.